Pietre dure is a form of polychrome inlay, similar to intarsia or marquetry though utilising gemstones rather than wood. (The Penguin Dictionary Of Decorative Arts has a useful entry on the subject.) The technique is also related to mosaics, and Giusti discusses the Cosmatesque geometric mosaic style. The book's main focus is on the Italian Renaissance revival of pietre dure, and its subsequent popularity among European royalty. Giusti is chief curator of the Opificio delle Pietre Dure, which established Florence as the centre of pietre dure production: "Florentine commesso work achieved a notable refinement in the well-established techniques of inlay, and the opus sectile of the Roman era." 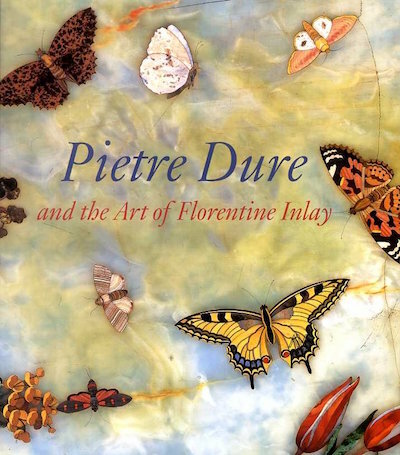 This is a superb introduction to the art of pietre dure, and it's one of the few English-language books on the subject. Its glossy, colour illustrations of inlaid tabletops and cabinets are lavishly reproduced, with many stunning full-page, full-bleed photographs. It was originally published in Italian, as L'arte Delle Pietre Dure (2005). It was then translated into French, as La Marqueterie De Pierres Dures, before its English translation was published the following year. The title of the American edition is Pietre Dure: The Art Of Semiprecious Stonework.